Studland Bay is a stunningly beautiful stretch of Dorset coastline near Swanage, part of which is owned by the National Trust. It is separated from the well-known sands of Bournemouth by the Poole harbour, and a chain ferry runs from Poole to Shell Bay which is at the head of Studland Bay. Using the car ferry as a foot passenger is a good idea when visiting Studland Bay as it is much easier to park in Poole than at Studland Bay itself. sandy beaches are popular for watersports, sailing, kayaking and windsurfing as the shallow waters are safe and comparatively warm. Some areas of the beach are designated for naturist sunbathing. 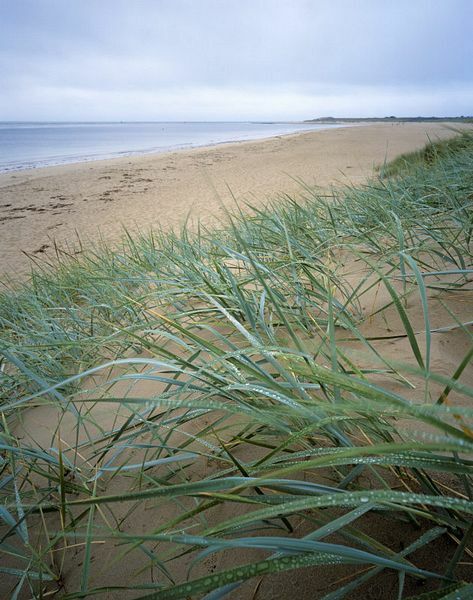 The sand dunes and heathland nearby is a wildlife haven for deer, insects and birds. Studland Nature Reserve is one of the top heathland sites and includes Gollingston Heath which is home to all six of Britain's reptiles. The area also has a wonderful array of wild flowers. 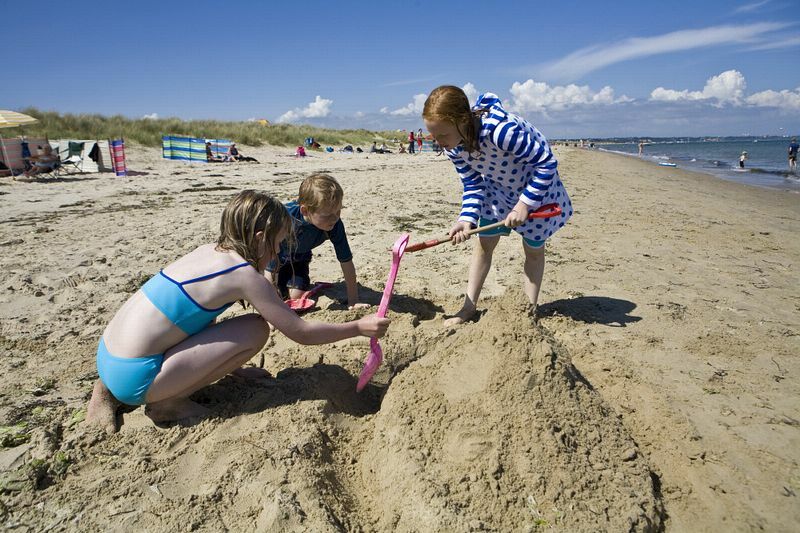 This lovely bay boasts some of longest hours of sunshine in England, making it a popular holiday destination, particularly with families and sailing enthusiasts. There are some beach huts for hire. The bay is protected from the prevailing winds by the rocks at the southern-most end, known as the Old Harry Rocks. The views extend across the channel to the distant shape of the Isle of Wight. Studland Bay is at the very beginning of the lengthy 630-mile South West Coast Path and as well as the clifftop paths there are many other marked walking trails through the sand dunes and woodlands. The red sandstone cliffs make a scenic backdrop to the dunes and beach below. Amongst the sand dunes there is a lake called Little Sea which was created when the sand dunes built up and cut off the lake from the sea. It is now a freshwater lake which is a haven for local wildlife and wading birds. Fans of Enid Blyton's "Noddy" books will be interested to note that the small village of Studland was the place that Toy Town was based upon. Children's trails, self-guided walks and other events are frequently arranged by the National Trust at Studland Bay and details are available from the Visitor Centre at Knoll Beach. There is also a study centre, toilets, a shop and café. Boat launching, kite surfing and horse riding are all permitted from the beach but charges apply.